Caledonian Maritime Assets Limited (CMAL) has picked up a national accolade at the RICS Award Grand Final in the Infrastructure category for its refurbishment project at Wemyss Bay Ferry Terminal. CMAL was announced as the regional winner earlier this year. Over 95 regional winners competed for national titles across eight categories at the RICS Awards Grand Final, which took place in London on 2nd November 2017. 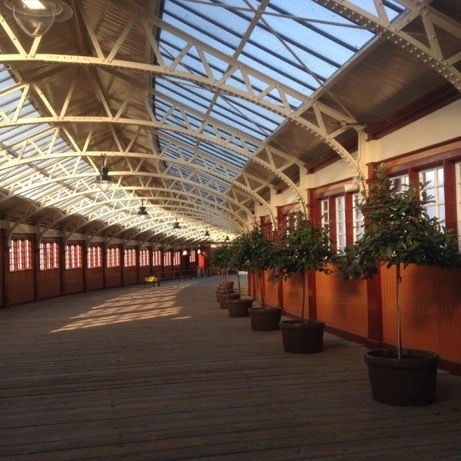 CMAL received the industry accolade for its £1 million upgrade of the Grade A listed historic timber pier walkway, which connects Wemyss Bay Ferry Terminal to Wemyss Bay Station. The walkway dates back to 1903 and is a prominent wrought iron and timber clad structure with a slate and glass roof. RICS judges said the walkway has been beautifully restored to its former glory whilst modern building techniques were successfully deployed to ensure future longevity of the pier, and improve the vessel fendering system. The upgrade was part of a £6 million investment in the ferry terminal, which also included a new fendering system to replace the pier timber fenders, reconstructed concrete pier roundhead, refurbished linkspan and installation of a corrosion protection system. The harbour was also dredged. CMAL worked with a range of design, engineer and construction partners to return the pier to its former glory, including WH Kirkwood Limited, Graham & Sibbald, George Leslie Limited, Wallace Stone LLP and CH2M. “This is fantastic recognition for our team and our partners and is further evidence of the hard work and commitment we invested to ensure we retained the original character of the historic building. The Grade A nature of the walkway made this a particularly challenging project. “In addition, during the project period, we battled a lot of inclement weather, with no less than 10 storms hitting the pier during the winter months. Due to fog at Heathrow, the CMAL team was unable to make it to the award ceremony to collect their award in person. CMAL own property at piers and harbours at more than 26 locations throughout Scotland. CMAL is delivering a programme of investment and improvements, which will create better facilities. In addition to its pier and harbour facilities, CMAL owns 33 ferries and leases one further ferry. All 33 vessels are leased to CalMac Ferries Ltd for use on ferry services on the Clyde and Hebrides. In addition, two ferries are currently under construction.